I’m either the right guy to be writing a review of a ‘new’ Christmas release… or I’m the wrong guy. You see, I’m a connoisseur of Christmas music and I’m extremely picky about the holiday music that I listen to. I don’t care who performs the song or in what style – I’m looking for the FEELING of the season in the song. And for someone who loves Christmas music, there’s very little that has tickled my fancy since the ‘70s. There are exceptions but my favorites tend to be random singles (XTC, Band Aid, Status Quo, etc.) and very few albums. Sure, I appreciate the attempts to create a new classic Christmas album but it is very obvious to me when it is merely a cash-grab by the artist or the label. Or almost as worse – when an artist is only interested in celebrating their own voice and not the holiday they sing so joyfully about. So, sadly, I now approach every Christmas album with trepidation and fear. And suddenly, Bloodshot Records’ 13 DAYS OF XMAS landed in my lap and I needed to take some anxiety medication before I could even listen to it…. Well, I’m happy to say that 13 DAYS OF XMAS is a joy to listen to! And when I say ‘joy’, I’m not necessarily referring to ‘ho ho ho’ and red-nosed reindeers and all that stuff that we normally associate with the holidays. It occupies a different musical universe and doesn’t pretend to be a classic Christmas album in the vein of Bing, Dean, Frank, Nat or Andy. On the other hand, it isn’t a slick, soul-less slice of holiday hoo-hah, either. This album is closer to a mix of NRBQ’s “Christmas Wish” meets Nick Lowe’s holiday-themed QUALITY STREET album with loads of spiked egg nog thrown into the mix. Sprinkle in some grizzled Americana and top it off with a big dollop of emotion and you’ve got 13 DAYS OF XMAS! While the performances may lean towards Alt-Country, almost every track has that FEELING that is so necessary in Christmas music. Again, it is not about what clothes you wear – your heart and soul define who you are. And no matter how dark or ramshackle a song my sound, the feeling is what matters most in Christmas music. While not adhering to all the rules of Christmas music, the bands featured here certainly understand what makes a holiday tune work. Even Devil In A Woodpile‘s “The Pagan’s Had It Right” sounds playful in a “yellow snow” kind of way. It may be the least Christmasy song on the album but it sure is fun! Highlights include Murder By Death’s “O Holy Night,” Kelly Hogan’s “Blue Snowfall,” Jon Langford’s “Christmas Carol, Christmas Ray,” All Our Exes Live In Texas’ “How To Make Gravy” and Barrence Whitefield’s “Papa Barrence’s Christmas”. 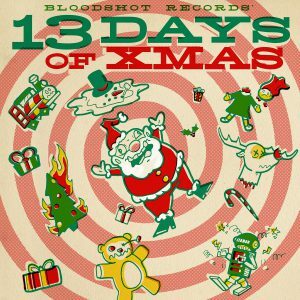 Add in stellar tracks from The Yawpers, Ha Ha Tonka and others and you’ve got a solid Christmas collection. While some of the songs aren’t the happiest of holiday tunes, they reflect the realities of this time of year and that is far more important than sugar coating everything. Good can’t exist without evil. Who would we know light if there wasn’t darkness? You can’t slap a bow on an empty box and call it a Christmas present so why record a Christmas song without real feeling? That just doesn’t make sense! This may not be your grandpa’s Christmas music… but that’s just cuz your grandpa is too damn old!